The Feminist Club Amsterdam is always looking for critical, thought-provoking publications. The FCA website is a platform that amplifies fresh and critical voices by means of publications that center on intersectional feminism rooted in Amsterdam. As a platform, we aim to stimulate and start discussions, inciting thought and reflection on particular issues, events, writings, and incidents. We open up space wherein, different opinions can be voiced and enable a platform that publishes multiple perspectives on similar and wide-ranging issues. In order to achieve such a platform, we invite YOU to write for us. We are eager to hear and read what you think about particular issues. We welcome articles/publications that fall under the categories of creative writing, opinion pieces, book/film/music/exhibition/event reviews, guides, academic writings, and interviews. -All submissions should be accompanied with a short introduction on who you are, identifying if you want to be identified in the article and a means to get a hold of you. 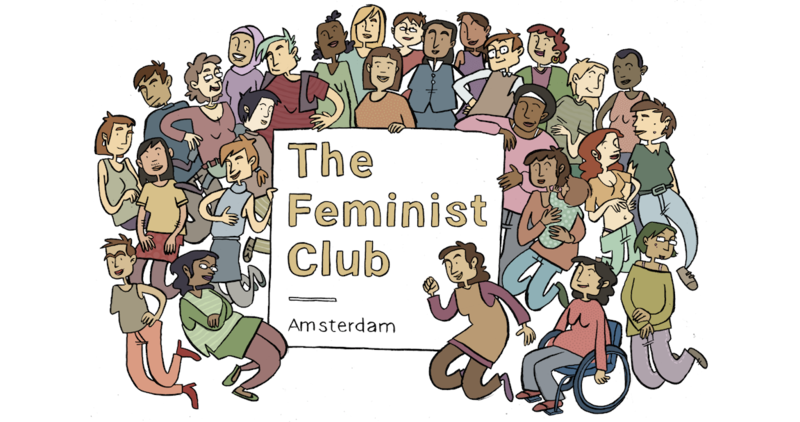 We Are Looking For: Since we are the Feminist Club Amsterdam, we’d like to be the website to go to for reviews on what’s happening in and around Amsterdam and the Netherlands more generally. We welcome praise and/or critique based on complex, intersectional arguments. We emphasize that the reviews and reflections must stand by the Code of Conduct of FCA. Please refer clearly to the event / person / incident / exhibition / music / film / book you are responding to, and, if possible, provide hyperlinks to this content so that it can be accessed by our readers. Or make sure that the subject under review is accessible for readers who haven’t read/visited/heard/seen what you’re writing on. Apt descriptions are thus encouraged and appreciated. Ideally, your reflection/review starts out with a description of the reviewed/reflected subject and is followed by a critical review/reflection based on thorough arguments. Submission: To submit an article please submit your piece to website@thefeministclub.nl along with a 250 word summary of who you are (bio), your perspective, and some insights into how you connect to the FCA mission. Decision: Our team will contact you within 10 days from your submission with the final decision on publishing the content, and possibly how to follow up with how we can promote and relate it to our events. We Are Looking For: We are looking for writers who bring sharp, incisive analysis of events, publications, and individuals that are able to situate their personal perspective based on fair and balanced analysis, lending insight into the subject. Important is that your opinion piece follows the FCA Code of Conduct. If relevant, please provide a link to the event/publication/ individual you are commenting on in order for us and your readers to follow along clearly. What we Are Looking For: As a platform, we’d like to build up a database of academic papers on a wide variety of subjects related to intersectional feminism, for people who are looking for readily available academic literature on specific topics. Therefore, we welcome academic articles and essays on various themes directly or indirectly relating to (intersecting) social inequalities. Please provide clear references and make sure your article/essay follows the FCA Code of Conduct. If your article/essay is approved by our team, your abstract will be published on the FCA page with a link to download the full article/essay. NOTE: The article/essay must be your personal contribution and you must have explicit rights to letting us publish it. We do not reserve exclusive rights to articles sent to us. Submission: To submit an article please send your piece (abstract and article/essay) in PDF format to website@thefeministclub.nl along with a 250 word summary of who you are (bio), your perspective, and some insights into how you connect to the FCA mission. Decision: Our team will contact you within 15 days from your submission with the final decision on publishing the content, and possibly how to follow up with how we can promote and relate it to our events. What We Are Looking For: People willing to provide hands-on guides to specific (daily life) topics in any form (e.g. video, comics, article, bulleted list), that abides to our Code of Conduct. Submission: Please send your piece to website@thefeministclub.nl along with a 250 word summary of who you are (bio), your perspective, and some insights into how you connect to the FCA mission. What We Are Looking For: Poems, fictional short stories, artistic expressions; give it to us. We are excited and interested to read what you have to offer so long as it sticks to our Code of Conduct. What We Are Looking For: Introductions on dense academic texts, subjects and concepts that will prime and help people to read related texts and/or to delve into the introduced subject. Please provide clear references and make sure your piece follows our Code of Conduct. NOTE: The submitted piece must be your personal contribution and you must have explicit rights to letting us publish it. We do not reserve exclusive rights to articles sent to us. Submission: To submit a primer please send your piece to our Code of Conduct along with a 250 word summary of who you are, your perspective, and some insights into how you connect to the FCA mission. What we are looking for: Visuals (images, comics, drawings, photographs, artworks) to cheer up our website, and regular contributions in order to have visuals accompany our articles. Submitted visuals should abide by our Code of Conduct. NOTE: Please ensure that the image is yours originally and is legally allowed to be shared, FCA does not reserve the exclusive rights to any works submitted to us. Submission: The submitted visual can take any form, but should be available digitally, and send to us digitally. You can submit anything, as long as you (are able to) submit it to website@thefeministclub.nl. Decision: Our team will contact you within 7 days from your submission with the final decision on publishing the content.